This article is about the investment firm. For the management consulting company, see Bain and Company. Bain Capital is a private investment firm based in Boston, Massachusetts. It specializes in private equity, venture capital, credit, public equity, impact investing, life sciences and real estate. Bain Capital invests across a range of industry sectors and geographic regions. As of 2018, the firm managed more than $105 billion of investor capital. In late 2011, Bain Capital moved its headquarters to the John Hancock Tower (now 200 Clarendon Street) in Boston, Massachusetts. Bain occupies 210,000 sq. ft. from the 36th to 43rd floors. The firm was founded in 1984 by partners from the consulting firm Bain & Company. Since inception it has invested in or acquired hundreds of companies including AMC Theatres, Artisan Entertainment, Aspen Education Group, Brookstone, Burger King, Burlington Coat Factory, Canada Goose, DIC Entertainment, Domino's Pizza, DoubleClick, Dunkin' Donuts, D&M Holdings, Guitar Center, Hospital Corporation of America (HCA), iHeartMedia, KB Toys, Sealy, Sports Authority, Staples, Toys "R" Us, Warner Music Group, Fingerhut, The Weather Channel, and Apple Leisure Group, which includes AMResorts and Apple Vacations. As of 2018, Bain Capital employed more than 1,000 people. Bain Capital is headquartered at 200 Clarendon Street in Boston, Massachusetts with additional offices in New York City, Chicago, Palo Alto, San Francisco, Dublin, London, Munich, Hong Kong, Shanghai, Mumbai, Tokyo, Melbourne and Sydney. The company, and its actions during its first 15 years, became the subject of political and media scrutiny as a result of co-founder Mitt Romney's later political career, especially his 2012 presidential campaign. Bain Capital was founded in 1984 by Bain & Company partners Mitt Romney, T. Coleman Andrews III, and Eric Kriss, after Bill Bain had offered Romney the chance to head a new venture that would invest in companies and apply Bain's consulting techniques to improve operations. In addition to the three founding partners, the early team included Fraser Bullock, Robert F. White, Joshua Bekenstein, Adam Kirsch, and Geoffrey S. Rehnert. Romney initially had the titles of president and managing general partner or managing partner. He later became referred to as managing director or CEO as well. He was also the sole shareholder of the firm. At the beginning, the firm had fewer than ten employees. In the face of skepticism from potential investors, Romney and his partners spent a year raising the $37 million in funds needed to start the new operation. Bain partners put in $12 million of their own money and sourced the rest from wealthy individuals. Early investors included Boston real estate mogul Mortimer Zuckerman and Robert Kraft, the owner of the New England Patriots football team. They also included members of elite Salvadoran families who fled the country's civil war. They and other wealthy Latin Americans invested $9 million primarily through offshore companies registered in Panama. While Bain Capital was founded by Bain executives, the firm was not an affiliate or a division of Bain & Company but rather a completely separate company. Initially, the two firms shared the same offices—in an office tower at Copley Place in Boston—and a similar approach to improving business operations. However, the two firms had put in place certain protections to avoid sharing information between the two companies and the Bain & Company executives had the ability to veto investments that posed potential conflicts of interest. Bain Capital also provided an investment opportunity for partners of Bain & Company. The firm initially gave a cut of its profits to Bain & Company, but Romney later persuaded Bill Bain to give that up. Bain Capital was an initial investor in Staples, Inc. The Bain Capital team was initially reluctant to invest its capital. By 1985, things were going poorly enough that Romney considered closing the operation, returning investors' money to them, and having the partners go back to their old positions. The partners saw weak spots in so many potential deals that by 1986, very few had been done. At first, Bain Capital focused on venture capital opportunities. One of Bain's earliest and most notable venture investments was in Staples, Inc., the office supply retailer. In 1986, Bain provided $4.5 million to two supermarket executives, Leo Kahn and Thomas G. Stemberg, to open an office supply supermarket in Brighton, Massachusetts. The fast-growing retail chain went public in 1989; by 1996, the company had grown to over 1,100 stores, and as of fiscal year end January 2012, Staples reached over $20 billion in sales, nearly $1.0B in net income, 87,000 employees, and 2,295 stores. Bain Capital eventually reaped a nearly sevenfold return on its investment, and Romney sat on the Staples board of directors for over a decade. Another very successful investment occurred in 1986 when $1 million was invested in medical equipment maker Calumet Coach, which eventually returned $34 million. A few years later, Bain Capital made an investment in the technology research outfit the Gartner Group, which ended up returning a 16-fold gain. Bain invested the $37 million of capital in its first fund in twenty companies and by 1989 was generating an annualized return in excess of 50 percent. By the end of the decade, Bain's second fund, raised in 1987 had deployed $106 million into 13 investments. As the firm began organizing around funds, each such fund was run by a specific general partnership—that included all Bain Capital executives as well as others—which in turn was controlled by Bain Capital Inc., the management company that Romney had full ownership control of. As CEO, Romney had a final say in every deal made. Beginning in 1989, the firm, which began as a venture capital source investing in start-up companies, adjusted its strategy to focus on leveraged buyouts and growth capital investments in more mature companies. Their model was to buy existing firms with money mostly borrowed against their assets, partner with existing management to apply Bain methodology to their operations (rather than the hostile takeovers practiced in other leverage buyout scenarios), and sell them off in a few years. Existing CEOs were offered large equity stakes in the process, owing to Bain Capital's belief in the emerging agency theory that CEOs should be bound to maximizing shareholder value rather than other goals. By the end of 1990, Bain had raised $175 million of capital and financed 35 companies with combined revenues of $3.5 billion. In July 1992, Bain acquired Ampad (originally American Pad & Paper) from Mead Corporation, which had acquired the company in 1986. Mead, which had been experiencing difficulties integrating Ampad's products into its existing product lines, generated a cash gain of $56 million on the sale. Under Bain's ownership, the company enjoyed a significant growth in sales from $106.7 million in 1992 to $583.9 million in 1996, when the company was listed on the New York Stock Exchange. Under Bain's ownership, the company also made a number of acquisitions, including writing products company SCM in July 1994, brand names from the American Trading and Production Corporation in August 1995, WR Acquisition and the Williamhouse-Regency Division of Delaware, Inc. in October 1995, Niagara Envelope Company, Inc. in 1996, and Shade/Allied, Inc. in February 1997. Ampad's revenue began to decline in 1997 and the company laid off employees and closed production facilities to maintain profitability. Employment declined from 4,105 in 1996 to 3,800 in 2000. The company ceased trading on the New York stock exchange on December 22, 2000 and filed for bankruptcy in 2001. At the time of the bankruptcy, Bain Capital held a 34.9% equity ownership interest in the company. The assets were acquired in 2003 by Crescent Investments. Bain's eight years' of involvement in Ampad is estimated to have generated over $100 million in profits ($60 million in dividends, $45–50 million from the proceeds from stock issued after the company went public, and $1.5-2 million in annual management fees). In 1994, Bain acquired Totes, a producer of umbrellas and overshoes. Three years later, Totes, under Bain’s ownership, acquired Isotoner, a producer of leather gloves. Bain, together with Thomas H. Lee Partners, acquired Experian, the consumer credit reporting business of TRW Inc., in 1996 for more than $1 billion. Formerly known as TRW's Information Systems and Services unit, Experian is one of the leading providers of credit reports on consumers and businesses in the US. The company was sold to Great Universal Stores for $1.7 billion just months after being acquired. Other notable Bain investments of the late 1990s included Sealy Corporation, the manufacturer of mattresses; Alliance Laundry Systems; Domino's Pizza and Artisan Entertainment. Much of the firm's profits was earned from a relatively small number of deals, with Bain Capital's overall success and failure rate being about even. One study of 68 deals that Bain Capital made up through the 1990s found that the firm lost money or broke even on 33 of them. Another study that looked at the eight-year period following 77 deals during the same time found that in 17 cases the company went bankrupt or out of business, and in 6 cases Bain Capital lost all its investment. But 10 deals were very successful and represented 70 percent of the total profits. Romney had two diversions from Bain Capital during the first half of the decade. From January 1991 to December 1992, Romney served as the CEO of Bain & Company where he led the successful turnaround of the consulting firm (he remained managing general partner of Bain Capital during this time). In November 1993, he took a leave of absence for his unsuccessful 1994 run for the U.S. Senate seat from Massachusetts; he returned the day after the election in November 1994. During that time, Ampad workers went on strike, and asked Romney to intervene; Bain Capital lawyers asked him not to get involved, although he did meet with the workers to tell them he had no position of active authority in the matter. In 1994, Bain invested in Steel Dynamics, based in Fort Wayne, Indiana, a prosperous steel company that has grown to the fifth largest in the U.S.A, employs about 6,100 people, and produces carbon steel products with 2010 revenues of $6.3 billion on steel shipments of 5.3 million tons. In 1993, Bain acquired the Armco Worldwide Grinding System steel plant in Kansas City, Missouri and merged it with its steel plant in Georgetown, South Carolina to form GST Steel. The Kansas City plant had a strike in 1997 and Bain closed the plant in 2001 laying off 750 workers when it went into bankruptcy. The South Carolina plant closed in 2003 but subsequently reopened under a different owner. At the time of its bankruptcy it reported $553.9 million in debts against $395.2 in assets. Bain reported $58.4 million in profits, the employee pension fund had a liability of $44 million. Bain's investment in Dade Behring represented a significant investment in the medical diagnostics industry. In 1994, Bain, together with Goldman Sachs Capital Partners completed a carveout acquisition of Dade International, the medical diagnostics division of Baxter International in a $440 million acquisition. Dade's private equity owners merged the company with DuPont's in vitro diagnostics business in May 1996 and subsequently with the Behring Diagnostics division of Hoechst AG in 1997. Aventis, the successor of Hoechst, acquired 52% of the combined company. In 1999, the company reported $1.3 billion of revenue and completed a $1.25 billion leveraged recapitalization that resulted in a payout to shareholders. The dividend, taken together with other previous shareholder dividends resulted in an eightfold return on investment to Bain Capital and Goldman Sachs. Revenues declined from 1999 through 2002 and despite attempts to cut costs through layoffs the company entered into bankruptcy in 2002. Following its restructuring, Dade Behring emerged from Bankruptcy in 2003 and continued to operate independently until 2007 when the business was acquired by Siemens Medical Solutions. Bain and Goldman lost their remaining stock in the company as part of the bankruptcy. By the end of the decade, Bain Capital was on its way to being one of the top private equity firms in the nation, having increased its number of partners from 5 to 18, having 115 employees overall, and having $4 billion under its management. The firm's average annual return on investments was 113 percent. It had made between 100 and 150 deals where it acquired and then sold a company. Romney took a paid leave of absence from Bain Capital in February 1999 when he became the head of the Salt Lake Organizing Committee for the 2002 Winter Olympics. The decision caused turmoil at Bain Capital, with a power struggle ensuing. Some partners left and founded the Audax Group and Golden Gate Capital. Other partners threatened to leave, and there was a prospect of eight-figure lawsuits being filed. Romney was worried that the firm might be destroyed, but the crisis ebbed. Romney was not involved in day-to-day operations of the firm after starting the Olympics position. Those were handled by a management committee, consisting of five of the fourteen remaining active partners with the firm. However, according to some interviews and press releases during 1999, Romney said he was keeping a part-time function at Bain. During his leave of absence, Romney continued to be listed in filings to the U.S. Securities and Exchange Commission as "sole shareholder, sole director, Chief Executive Officer and President". The SEC filings reflected the legal reality and the ownership interest in the Bain Capital management company. In practice, former Bain partners have stated that Romney's attention was mostly occupied by his Olympics position. He did stay in regular contact with his partners, and traveled to meet with them several times, signing corporate and legal documents and paying attention to his own interests within the firm and to his departure negotiations. Bain Capital Fund VI in 1998 was the last one Romney was involved in; investors were worried that with Romney gone, the firm would have trouble raising money for Bain Capital Fund VII in 2000, but in practice the $2.5 billion was raised without much trouble. His former partners have said that Romney had no role in assessing other new investments after February 1999, nor was he involved in directing the company’s investment funds. Discussions over the final terms of Romney's departure dragged on during this time, with Romney negotiating for the best deal he could get and his continuing position as CEO and sole shareholder giving him the leverage to do so. Although he had left open the possibility of returning to Bain after the Olympics, Romney made his crossover to politics in 1999. His separation from the firm was finalized in early 2002. Romney negotiated a ten-year retirement agreement with Bain Capital that allowed him to receive a passive profit share and interest as a retired partner in some Bain Capital entities, including buyout and Bain Capital investment funds, in exchange for his ownership in the management company. Because the private equity business continued to thrive, this deal would bring him millions of dollars in annual income. Romney was the first and last CEO of Bain Capital; since his departure became final, it has continued to be run by management committee. Bain Capital itself, and especially its actions and investments during its first 15 years, came under press scrutiny as the result of Romney's 2008 and 2012 presidential campaigns. Romney's leave of absence and the level of activity he had within the firm during the 1999-2002 period also garnered attention. In 2002, Bain acquired Burger King together with TPG Capital and Goldman Sachs Capital Partners. In 2000, DIC Entertainment chairman and CEO Andy Heyward partnered with Bain Capital Inc in a management buyout of DIC from The Walt Disney Co. Heyward continued as chairman and CEO of the animation studio, which has more than 2,500 half-hours of programming in its library. He purchased Bain Capital's interest in 2004 and took the company public the following year. Bain Capital began the new decade by closing on its seventh fund, Bain Capital Fund VII, with over $3.1 billion of investor commitments. The firm's most notable investments in 2000 included the $700 million acquisition of Datek, the online stock brokerage firm, as well as the $305 million acquisition of KB Toys from Consolidated Stores. Datek was ultimately merged with Ameritrade in 2002. 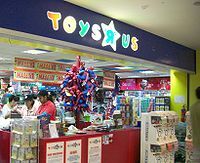 KB Toys, which had been financially troubled since the 1990s as a result of increased pressure from national discount chains such as Walmart and Target, filed for Chapter 11 bankruptcy protection in January 2004. Bain had been able to recover value on its investment through a dividend recapitalization in 2003. In early 2001, Bain agreed to purchase a 30 percent stake, worth $600 million, in Huntsman Corporation, a leading chemical company owned by Jon Huntsman, Sr., but the deal was never completed. With a significant amount of committed capital in its new fund available for investment, Bain was one of a handful of private equity investors capable of completing large transactions in the adverse conditions of the early 2000s recession. In July 2002, Bain together with TPG Capital and Goldman Sachs Capital Partners, announced the high-profile $2.3 billion leveraged buyout of Burger King from Diageo. However, in November the original transaction collapsed, when Burger King failed to meet certain performance targets. In December 2002, Bain and its co-investors agreed on a reduced $1.5 billion purchase price for the investment. The Bain consortium had support from Burger King's franchisees, who controlled approximately 92% of Burger King restaurants at the time of the transaction. Under its new owners, Burger King underwent a major brand overhaul including the use of The Burger King character in advertising. 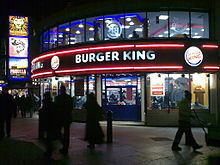 In February 2006, Burger King announced plans for an initial public offering. In late 2002, Bain remained active acquiring Houghton Mifflin for $1.28 billion, together with Thomas H. Lee Partners and Blackstone Group. Houghton Mifflin and Burger King represented two of the first large club deals, completed since the collapse of the Dot-com bubble. In November 2003, Bain completed an investment in Warner Music Group. In 2004 Bain acquired the Dollarama chain of dollar stores, based in Montreal, Quebec, Canada and operating stores in the provinces of Eastern Canada for $1.05 billion CAD. In March 2004, Bain acquired Brenntag Group from Deutsche Bahn AG (Exited in 2006; sold to BC Partners for $4B). In August 2003, Bain acquired a 50% interest in Bombardier Inc.'s recreational products division, along with the Bombardier family and the Caisse de dépôt et placement du Québec, and created Bombardier Recreational Products or BRP. The following year, in 2005, Bain was one of seven private equity firms involved in the buyout of SunGard in a transaction valued at $11.3 billion. Bain's partners in the acquisition were Silver Lake Partners, TPG Capital, Goldman Sachs Capital Partners, Kohlberg Kravis Roberts, Providence Equity Partners, and Blackstone Group. This represented the largest leveraged buyout completed since the takeover of RJR Nabisco at the end of the 1980s leveraged buyout boom. Also, at the time of its announcement, SunGard would be the largest buyout of a technology company in history, a distinction it would cede to the buyout of Freescale Semiconductor. The SunGard transaction is also notable in the number of firms involved in the transaction, the largest club deal completed to that point. The involvement of seven firms in the consortium was criticized by investors in private equity who considered cross-holdings among firms to be generally unattractive. Bain led a consortium, together with The Carlyle Group and Thomas H. Lee Partners to acquire Dunkin' Brands. The private equity firms paid $2.425 billion in cash for the parent company of Dunkin' Donuts and Baskin-Robbins in December 2005. In 2006, Bain Capital and Kohlberg Kravis Roberts, together with Merrill Lynch and the Frist family (which had founded the company) completed a $31.6 billion acquisition of Hospital Corporation of America, 17 years after it was taken private for the first time in a management buyout. At the time of its announcement, the HCA buyout was the first of several to set new records for the largest buyout, eclipsing the 1989 buyout of RJR Nabisco. It was later surpassed by the buyouts of EQ Office and TXU. In August 2006, Bain was part of the consortium, together with Kohlberg Kravis Roberts, Silver Lake Partners and AlpInvest Partners, that acquired a controlling 80.1% share of semiconductors unit of Philips for €6.4 billion. The new company, based in the Netherlands, was renamed NXP Semiconductors. During the buyout boom, Bain was active in the acquisition of various retail businesses. In January 2006, Bain announced the acquisition of Burlington Coat Factory, a discount retailer operating 367 department stores in 42 states, in a $2 billion buyout transaction. Six months later, in October 2006, Bain and The Blackstone Group acquired Michaels Stores, the largest arts and crafts retailer in North America in a $6.0 billion leveraged buyout. Bain and Blackstone narrowly beat out Kohlberg Kravis Roberts and TPG Capital in an auction for the company. In June 2007, Bain agreed to acquire HD Supply, the wholesale construction supply business of Home Depot for $10.3 billion. Bain, along with partners Carlyle Group and Clayton, Dubilier & Rice, would later negotiate a lower price ($8.5 billion) when the initial stages of the subprime mortgage crisis caused lenders to seek to renegotiate the terms of the acquisition financing. Just days after the announcement of the HD Supply deal, on June 27, Bain announced the acquisition of Guitar Center, the leading musical equipment retailer in the U.S. Bain paid $1.9 billion, plus $200 million in assumed debt, representing a 26% premium to the stock's closing price prior to the announcement. Bain also acquired Edcon Limited, which operates Edgars Department Stores in South Africa and Zimbabwe for 25 billion-rand ($3.5 billion) in February 2007. Other investments during the buyout boom included: Bavaria Yachtbau, acquired for €1.3 billion in July 2007 as well as Sensata Technologies, acquired from Texas Instruments in 2006 for approximately $3 billion. In the wake of the closure of the credit markets in 2007 and 2008, Bain managed to close only a small number of sizable transactions. In July 2008, Bain, together with NBC Universal and Blackstone Group agreed to purchase The Weather Channel from Landmark Communications. July 2008 – Bain, together with Thomas H. Lee Partners, acquired Clear Channel Communications. July 2008 – Bain acquired D&M Holdings for $442 million. June 2009 – Bain Capital announced a deal to acquire a 9–23 percent stake in Chinese electronics manufacturer GOME Electrical Appliances for $233–432 million. March 2010 – Bain acquired Styron (polystyrene, latex), a division of The Dow Chemical Company, for $1.6 billion. October 2010 – Bain acquired Gymboree for $1.8 billion. January 2012 – Bain acquired Physio-Control for $478 million. August 2012 – Bain Capital announced that it had entered into an agreement to acquire a 30.49% stake in Genpact Ltd., India's Largest BPO / Call Center Outsourcing firm, (NYSE:G) from General Atlantic LLC and Oak Hill Capital Partners for $1 Billion U.S. Dollars. October 2012 – Bain Capital acquired hand and power tool company Apex Tool Group from Cooper Industries and Danaher Corporation for a fee of around $1.6 billion. May 2013 – Bain Capital and Investment Firms Golden Gate Capital, GIC Private Limited, and Insight Venture Partners entered into agreement to purchase BMC Software for a fee of around $6.9 billion. December 2013 – Bain Capital acquired a majority stake in the clothing chain, Canada Goose Inc. Invests $20 million in Observeit, a leading provider of user activity recording and auditing software. April 2014 - Bain Capital purchases a controlling stake in Viewpoint Construction Software, a construction-specific software company based in Portland, Oregon. November 2014 - Bain Capital and Virgin Group announced they were creating a new cruise line, Virgin Holidays Cruises. December 2014 - Bain Capital agreed to a purchase of four divisions of CRH for a sum of £414 million, including its subsidiary Ibstock. In 2016, the firm elevated Jonathan Lavine and John Connaughton to co-managing partners, while also naming Steven Pagliuca and Joshua Bekenstein co-chairman of the firm. August 2017 - Bain acquired together with Cinven German company Stada Arzneimittel. August 2017 - Bain acquired Diversey from Sealed Air. February 2018 - Bain agreed to acquire Bugaboo International for an undisclosed amount. March 2018 - Bain purchased 19.99% of shares in Tower Ltd that Suncorp has ownership in. January 2019 - Bain purchased majority stake in Brillio. Bain Capital's businesses include private equity, venture capital, public equity, and credit. The firm also has specialized businesses focused on impact investing, life sciences and real estate. Bain Capital Private Equity has raised ten funds and invested in more than 250 companies. The private equity activity includes leveraged buyouts and growth capital in a wide variety of industries. Bain began investing in Europe in 1989 through its London-based affiliate Bain Capital Europe. Bain also operates international affiliates Bain Capital Asia and Bain Capital India. Bain Capital Private Equity is made up of more than 250 investment professionals, including 38 managing directors operating from offices in Boston, Hong Kong, London, Mumbai, Munich, New York, Shanghai, and Tokyo, as of the beginning of 2011. Bain Capital Ventures is the venture capital arm of Bain Capital, focused on seed through late-stage growth equity, investing in business services, consumer, healthcare, internet & mobile, and software companies. Bain Capital Ventures has raised approximately $1.53 billion of investor capital since 2001 across four investment funds. Since 2001, Bain Capital Ventures' most notable investments include DoubleClick, LinkedIn, Shopping.com, Taleo Corporation, MinuteClinic and SurveyMonkey. Originally founded as Brookside Capital, Bain Capital Public Equity is the public equity affiliate of Bain Capital. Established in October 1996, Bain Capital Public Equity's primary objective is to invest in securities of publicly traded companies that offer opportunities to realize substantial long-term capital appreciation. Bain Capital Public Equity employs a long/short equity strategy to reduce market risk in the portfolio. Originally founded as Sankaty Advisors, Bain Capital Credit is the fixed income affiliate of Bain Capital, a manager of high yield debt securities. With approximately $30 billion of assets under management, Bain Capital Credit invests in a wide variety of securities, including leveraged loans, high-yield bonds, distressed securities, mezzanine debt, convertible bonds, structured products and equity investments. Bain Capital Credit has approximately 140 employees, including 80 investment professionals across offices in the United States, Europe, Asia and Australia. Bain Capital Double Impact focuses on impact investing with companies that provide financial returns as well as social and environmental impact. In 2015, Bain Capital hired Deval Patrick, former Massachusetts Governor, to lead the new business division. Bain Capital Double Impact closed its initial fund of $390 million in July 2017. Bain Capital Life Sciences invests in companies that focus on medical innovation and serve patients with unmet medical needs. Bain Capital Life Sciences raised its first fund of $720 million in May 2017. Bain Capital Real Estate formed in February 2018 when Harvard Management Company shifted the management of its real estate investment portfolio to Bain Capital. The Bain Capital Real Estate team is managed by professionals from Harvard Management Company’s former real estate team. Bain Capital's approach of applying consulting expertise to the companies it invested in became widely copied within the private equity industry. University of Chicago Booth School of Business economist Steven Kaplan said in 2011 that the firm "came up with a model that was very successful and very innovative and that now everybody uses." In his 2009 book The Buyout of America: How Private Equity Is Destroying Jobs and Killing the American Economy, Josh Kosman described Bain Capital as "notorious for its failure to plow profits back into its businesses," being the first large private-equity firm to derive a large fraction of its revenues from corporate dividends and other distributions. The revenue potential of this strategy, which may "starve" a company of capital, was increased by a 1970s court ruling that allowed companies to consider the entire fair-market value of the company, instead of only their "hard assets", in determining how much money was available to pay dividends. In at least some instances, companies acquired by Bain borrowed money in order to increase their dividend payments, ultimately leading to the collapse of what had been financially stable businesses. ^ "People". Bain Capital. Retrieved December 3, 2018. ^ a b c d e "About Us". Bain Capital. Retrieved December 3, 2018. ^ Klein, Alex. "Bill Bain Speaks: 'The Unfair Attacks Are Not Worth Responding To'". The Daily Beast. Retrieved July 22, 2014. ^ "Bain Capital Company Statistics". Statistics Brain. Retrieved July 22, 2014. ^ "Locations | Bain Capital". www.baincapital.com. Retrieved September 6, 2018. ^ Knickerbocker, Brad (June 23, 2012). "Why is Mitt Romney's time at Bain Capital such a target?". The Christian Science Monitor. ^ Pappu, Sridhar (September 2005). "The Holy Cow! Candidate". The Atlantic Monthly. ^ a b Fabrikant, Geraldine (January 30, 1991). "Bain Names Chief Executive And Begins a Reorganization". The New York Times. ^ Horowitz, Alan S. (February 1, 1992). "Venture capital primer". Utah Business. Archived from the original on January 17, 2013. ^ a b c d e Blum, Justin; Lerer, Lisa (July 20, 2011). "Romney's Record Defies Image as Job-Creator". Bloomberg News. ^ a b Rees, Matthew (December 1, 2006). "Mister PowerPoint Goes to Washington". The American. Archived from the original on January 30, 2012. ^ a b c d Kirkpatrick, David D. (June 4, 2007). "Romney's Fortunes Tied to Business Riches". The New York Times. ^ a b Tanfani, Joseph; Melanie Mason; Matea Gold (July 19, 2012). "Bain Capital started with help of offshore investors". Los Angeles Times. Retrieved July 21, 2012. ^ Elliot, Justin (January 20, 2012). "The roots of Bain Capital in El Salvador's civil war". Salon. Retrieved July 21, 2012. ^ Kranish; Helman, The Real Romney, p. 133. ^ a b Sorkin, Andrew Ross (June 4, 2007). "Romney's Presidential Run Puts Spotlight on Bain Capital". The New York Times. ^ Kranish; Helman, The Real Romney, p. 138. ^ a b c d e f Gavin, Robert; Pfeiffer, Sacha (June 26, 2007). "The Making of Mitt Romney: Part 3: Reaping profit in study, sweat". The Boston Globe. ^ a b c d e Barbaro, Michael (November 13, 2011). "After a Romney Deal, Profits and Then Layoffs". The New York Times. p. A1. ^ a b c Confessore, Nicholas; Shear, Michael D. (July 16, 2012). "When Did Romney Step Back From Bain? It's Complicated, Filings Suggest". The New York Times. p. A10. ^ a b c d e f g h i j Healy, Beth; Kranish, Michael (July 20, 2012). "Romney kept reins, bargained hard on severance". The Boston Globe. ^ "American Pad & Paper Company Profile". Answers.com. Retrieved February 11, 2012. ^ a b Kranish, Michael; Helman, Scott (February 2012). "The Meaning of Mitt". Vanity Fair. ^ a b c Maremont, Mark (January 9, 2012). "Romney at Bain: Big Gains, Some Busts". The Wall Street Journal. ^ Fabrikant, Geraldine (January 30, 1991). "Bain Names Chief Executive And Begins a Reorganization". The New York Times. ^ Helling, Dave (January 6, 2012). "Bain Capital tied to bankruptcy, closing of KC steel plant". KansasCity.com. Retrieved February 1, 2012. ^ David Wren. "Romney's Bain made millions as S.C. steelmaker went bankrupt". KansasCity.com. Retrieved February 1, 2012. ^ "Missouri Valley Special Collections : Item Viewer". Kchistory.org. February 8, 2001. Archived from the original on January 16, 2013. Retrieved February 1, 2012. ^ Sullivan, Andy (January 6, 2012). "Special report: Romney's steel skeleton in the Bain closet". Reuters. Retrieved February 1, 2012. ^ a b Byers, Dylan. "Bain Capital: Romney left in Feb. 1999". Politico. Retrieved July 23, 2014. ^ Glenn Kessler (July 12, 2012). "Mitt Romney and his departure from Bain" (blog by expert). The Washington Post. Retrieved July 14, 2012. ^ a b c Kranish; Helman, The Real Romney, pp. 206–207. ^ "Is Romney to Blame for Cancer Death?". FactCheck. August 8, 2012. ^ Callum Borchers (July 16, 2012). "Mitt Romney and backers use 'day-to-day' to reshape questions about Bain". The Boston Globe. Retrieved August 13, 2012. ^ Bain Capital Fund VI, L.P. (February 20, 2001). "SCHEDULE 13D (Rule 13d-101)". Securities and Exchange Commission. Retrieved July 14, 2012. Bain Capital, Inc., a Delaware corporation ("Bain Capital"), is the sole managing partner of the BCIP entities. Mr. W. Mitt Romney is the sole shareholder, sole director, Chief Executive Officer and President of Bain Capital and thus is the controlling person of Bain Capital. ^ Marshall, John. "No, Romney Didn't Leave Bain in 1999". Retrieved July 11, 2012. ^ Borchers, Callum. "Mitt Romney stayed at Bain 3 years longer than he stated". Christopher M. Mayer. Retrieved July 12, 2012. ^ a b c Gentile, Sal (July 15, 2012). "Former Bain Capital partner says Romney was 'legally' CEO of Bain Capital until 2002". msnbc.com. Archived from the original on July 19, 2012. ^ a b Braun, Stephen; Gillum, Jack (July 25, 2012). "Fact Check: Romney Met Bain Partners After Exit". Associated Press. ^ King, John. "John King: Why is 1999 so important in 2012?". CNN. Retrieved July 12, 2012. ^ Charles, Deborah (July 12, 2012). "Romney faces new questions over tenure at Bain". Chicago Tribune. Reuters. ^ Kuhnhenn, Jim (August 14, 2007). "Romney Worth As Much As $250 Million". The Washington Post. Associated Press. Archived from the original on February 4, 2012. Retrieved January 17, 2012. ^ a b Confessore, Nicholas; Drew, Christopher; Creswell, Julie (December 18, 2011). "Buyout Profits Keep Flowing to Romney". The New York Times. ^ Callum Borchers; Christopher Rowland (July 12, 2012). "Mitt Romney stayed at Bain 3 years longer than he stated: Firm's 2002 filings identify him as CEO, though he said he left in 1999". The Boston Globe. Retrieved July 14, 2012. ^ Glenn Kessler (July 13, 2012). "Do Bain SEC documents suggest Mitt Romney is a criminal?" (blog by expert). The Washington Post. Retrieved July 14, 2012. ^ Michael D. Shear (July 13, 2012). "Romney Seeks Obama Apology for Bain Attacks". The New York Times. Retrieved July 14, 2012. ^ "Mitt Romney's Own 2002 Testimony Undermines Bain Departure Claim". Huffington Post. July 12, 2012. Retrieved July 14, 2012. [Statement by Bain] "Mitt Romney left Bain Capital in February 1999 to run the Olympics and has had absolutely no involvement with the management or investment activities of the firm or with any of its portfolio companies since the day of his departure," the statement reads. "Due to the sudden nature of Mr. Romney's departure, he remained the sole stockholder for a time while formal ownership was being documented and transferred to the group of partners who took over management of the firm in 1999. Accordingly, Mr. Romney was reported in various capacities on SEC filings during this period." ^ Elspeth Reeve (July 12, 2012). "Why Romney's Quit Date at Bain Matters". Atlantic Wire. Retrieved July 14, 2012. ^ Grace Wong (May 12, 2006). "Burger King IPO set to fire up". CNN Money. Retrieved September 30, 2007. ^ Zimmerman, Ann; Berman, Dennis K. (June 20, 2007). "Home Depot Boosts Buyback, Sets Unit Sale". The Wall Street Journal. ^ Robert Marich. "The Weather Channel Sale Wraps". Broadcasting & Cable. Archived from the original on September 15, 2008. Retrieved September 26, 2008. ^ Michael J. de la Merced (July 7, 2008). "Weather Channel Is Sold to NBC and Equity Firms". The New York Times. Retrieved September 17, 2008. ^ "Bain acquires Clear Channel Communications". Reuters. Archived from the original on February 16, 2007. ^ "D&M Saga Finally Ends With Bain Capital Deal - 2008-07-07 06:00:00". TWICE. Archived from the original on December 30, 2011. Retrieved February 11, 2012. ^ Barboza, David (June 22, 2009). "Bain Capital to Invest in Chinese Retailer". The New York Times. ^ Dagher, Veronica; Holmes, Elizabeth (October 12, 2010). "Bain Pays .8 Billion for Gymboree". The Wall Street Journal. ^ "Genpact Announces Agreement for Bain Capital Partners to Buy $1 Billion of Shares from Existing Sponsors" (PDF). Retrieved July 8, 2013. ^ "Deals of the day – mergers and acquisitions". Reuters. October 10, 2012. ^ "BMC Software Signs Definitive Agreement to be Acquired for $46.25 per Share in Cash". Retrieved July 8, 2013. ^ Cameron French (December 10, 2013). "Bain Capital buys majority stake in parka maker Canada Goose". Reuters. ^ Rogoway, Mike (April 22, 2014). "Bain Capital takes a $230 million stake in Portland-based Viewpoint Construction Software". Oregon Live. Retrieved July 23, 2017. ^ Ring, Niahm. "Billionaire Branson's Virgin to Launch Bain-Backed Cruise Line". Bloomberg. Retrieved December 5, 2014. ^ "US private equity firm buys brickmaker Ibstock". The Guardian. Retrieved January 5, 2014. ^ "Bain agrees to buy Blue Coat for around $2.4 billion". Reuters. Retrieved March 10, 2015. ^ Primack, Dan. "Bain Capital Memo Details Management Changes". Fortune. Retrieved July 1, 2016. ^ McBeth, Paul (March 8, 2018). "Vero sells Tower stake to US private equity Bain Capital for $7.5 million loss". NZ Herald. ISSN 1170-0777. Retrieved March 8, 2018. ^ Capital, Bain. "Bain Capital". www.baincapital.com. Retrieved September 6, 2018. ^ a b "Bain Capital raises $720 million for life sciences fund - The Boston Globe". BostonGlobe.com. Retrieved September 6, 2018. ^ a b "Deval Patrick revels in role developing Bain's social impact fund - The Boston Globe". BostonGlobe.com. Retrieved September 6, 2018. ^ a b c Comtois, James (December 15, 2017). "Bain Capital to assume management of Harvard's $3.4 billion direct real estate portfolio". Pensions & Investments. Retrieved September 6, 2018. ^ Rusli, Evelyn M. (January 30, 2012). "Bain Capital Ventures Raises $600 Million Fund". Dealbook.nytimes.com. Retrieved February 11, 2012. ^ "LinkedIn Closes Its Round; Got That Billion Dollar Valuation". Techcrunch.com. January 31, 2012. Retrieved February 11, 2012. ^ Business Wire (April 20, 2009). "SurveyMonkey Announces Group Led by Spectrum Equity to Become Majority Investor". Businesswire.com. Retrieved February 11, 2012. ^ a b Kreutzer, Laura. "Bain Capital Rebrands Credit Affiliate, Public Equity Unit". The Wall Street Journal. Retrieved April 13, 2016. ^ Impact, Double. "About Us | BainCapital Double Impact". www.baincapitaldoubleimpact.com. Retrieved September 6, 2018. ^ Reporter, MJ Lee, Politics and Finance. "Deval Patrick joins Bain Capital - CNNPolitics". CNN. Retrieved September 6, 2018. ^ Capital, Bain. "Life Sciences | Bain Capital". www.baincapital.com. Retrieved September 6, 2018. ^ Editorial, Reuters. "Harvard to outsource real estate investment to Bain Capital". U.S. Retrieved September 6, 2018. ^ Vickers, Marcia (June 27, 2007). "The Republicans' Mr. Fix-it". Fortune. ^ Kosman, The Buyout of America, p. 106. ^ Kosman, The Buyout of America, p. 118. Kosman, Josh (2009). The Buyout of America: How Private Equity Is Destroying Jobs and Killing the American Economy. Portfolio Hardcover. ISBN 1591843693.